With each type of carbohydrate you can choose meat or fish and some sort of sauce, usually highly spiced. But if all this is too unfamiliar, they do sell the Brixton favourite – rice and beans with grilled jerk chicken – and the more accessible jollef rice, which is a sort of spicy risotto. As we found with the restaurants in Ghana, it seems impossible to eat all the starchy part of the meal. I only ate a quarter of my rice ball (two large tennis balls of solid rice) but my partner managed all his peanut soup and half his banku – a considerable achievement, even on an empty stomach. There’s no shame in eating with a spoon and fork, as we did, but they do provide bowls and liquid soap, if you want the authentic experience of eating with your fingers. It might be thought that this is an impossible task with the soup but the art is to form the starch accompaniment into little scoops. This is not fine cuisine but it is interesting, tasteful and, most definitely, filling. The whole meal was cheap – it would be hard to spend a lot of money with the main dishes costing no more than £6.00. We didn’t have any drinks on this occasion but there is water and other soft drinks available. I used to walk past this restaurant every day on my way to the tube. 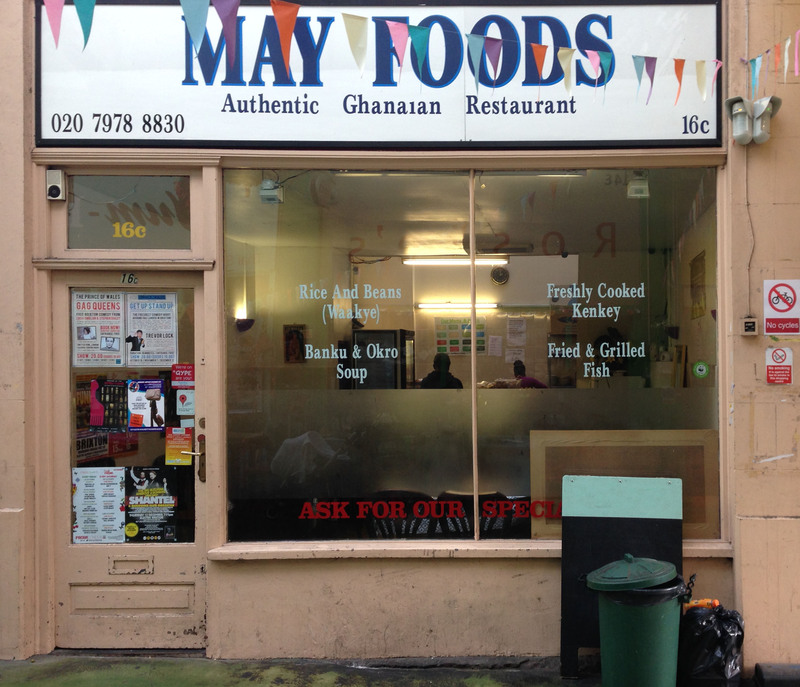 My parents are Ghanaian and I would often crave home cooking, never thought to pop in and pick something up from here. I will definitely have to eat here when I am back in London from Montreal! Thanks for reviewing it. Louise.